A few pictures of the numerous valves I seem to have accumulated on my travels. How come I have so many valves? Well, in the early years of Summers Laboratories Inc, funding was somewhat in absence so other sources of components had to be found... 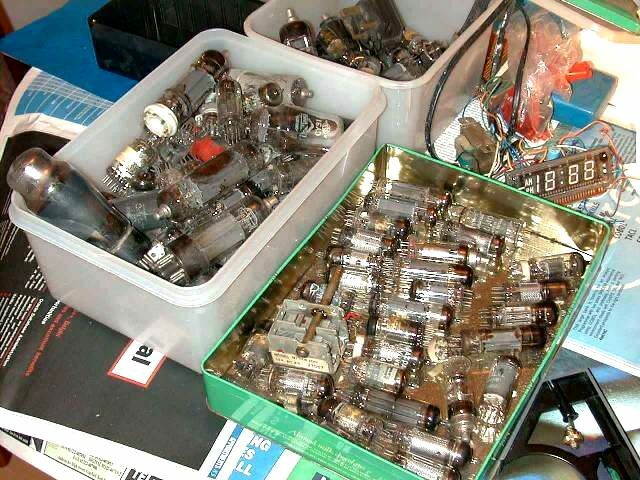 In those days I would obtain old electronics equipment from anywhere I could get my hands on it. This included rubbish dumps, jumble sales where you could pick up working radios and TVs for a few pence, and family friends getting rid of old or broken stuff. Once, I even happened to be in the local electrical store, Jacksons, where an old lady was being given back a radio she had previously taken in for repair. According to the electrical shop, it was beyond repair, and they were sorry. Naturally I volunteered to relieve the old lady of the disfunctional radio. When I took it home I put a battery in it and it worked perfectly. After that I wasn't particularly impressed by the technical abilities of the staff at Jacksons, but they were still useful if you needed a particular battery or bulb, or perhaps a piece of wire or mains plug. I used to spend hours painstakingly dismantling this equipment and sorting out the parts. Almost all the projects I subsequently made used these 2nd hand parts, I only rarely actually bought a new component, and only then if I absolutely could not make do with something from my junk cupboard. This minimalist way of working has a great philosophical attraction I find, such that today when cashflow is a little better, I still tend to adopt this approach where possible! Later, I found many old digital cicuit boards, from which I could salvage many useful integrated circuits (ICs). The Summers Laboratories used to see phases of intense construction, from which emerged many of the other things you'll find on this site, and similarly severe periods of deconstruction. At time the activity was so intense that the whole floor of the lab (=my bedroom) was completely covered with the half-dismantled carcasses of old TVs etc, with only a 2 foot wide corridor leading from the door to my bed! I didn't always dismantle things immediately. Usually first I would see if they worked. If they did and were sufficiently impressive they might be kept, intact. But more usually I would learn huge amounts by taking them apart, about how they were made and how the circuits were designed. Once I had an old and very large colour TV. The receiver part of it didn't work well but the screen lit up. I had the idea I might convert it into a huge oscilloscope, so I fixed up some amplifiers to drive the scanning coils on the back of the screen. It actually worked in a way, but the shapes drawn on the screen bore little resemblence to the real waveforms I thought SHOULD be displayed. After thinking about it for a bit, I realised this was most probably because those large coils can't vary their magnetic field quickly. In a TV the vertical coil scans the screen at 50 frames per second. The horizontal scan rate is 15,625 Hz. Probably if I had settled for the 50 frames per second, and tipped the TV so it was standing on one end, I could have made it work a lot more nicely. I would then have scanned the vertical coil for the X axis and the horizontal coil, which can move more quickly, for the Y axis. I have a feeling though that one would still need very carefully designed amplifiers. In a real oscilloscope electrical fields inside the tube deflect the beam. Electrical fields are a lot easier to move than the magnetic field displacement used in TVs. Well, out of that I learnt a lot and had plenty of fun doing so. 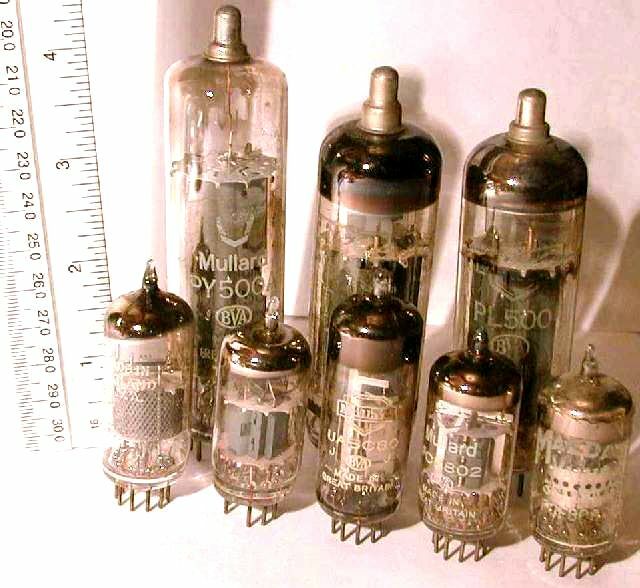 A few small valves, some of these would typically be found in old radio receivers or televisions. 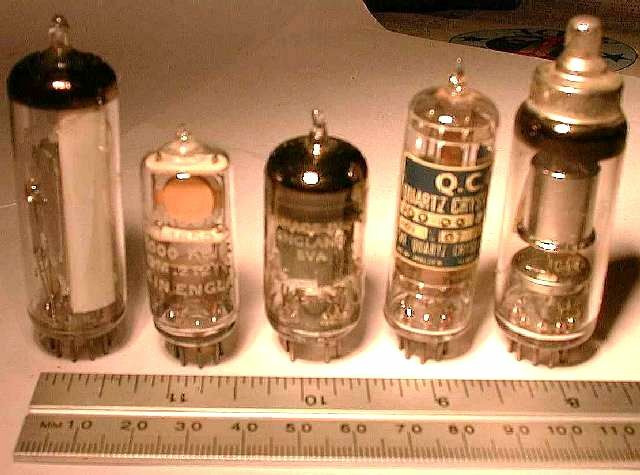 However I selected a non-typical assortment - the one on the left is a so-called "Magic-Eye", in old radio receivers the white strip in the valve would glow a green kind of colour to indicate tuning strength. I have actually seen one of these in action and if I recall it looks a bit like an exclamation mark. 2nd from the left and 2nd from the right are quartz crystals, 1000 and 100 KCycles (KHz in modern terms!) repectively. Nowadays quartz crystals are usually encapsulated in very small metal boxes. Sorry about the distinct lack of focus! A few of the larger valves. 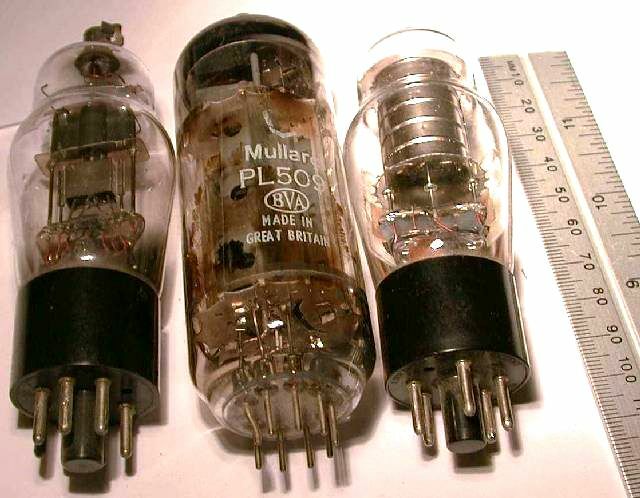 Of course, the older valves are the larger they are, but sometimes the large ones are just large so that they can handle high powers, for example the PL509 pictured here was a very common amplifier valve in the cathode-ray-tube driving part of old televisions. A mix of some of the small ones and the larger ones, for comparison. See the PL500, another TV valve. So, now you can see the kind of place I got my valve collection from! Most of my valves reside in these three boxes. The other photos on this page were a fairly random selection from those in these boxes.